The detailed map is also available on www.wien.at. 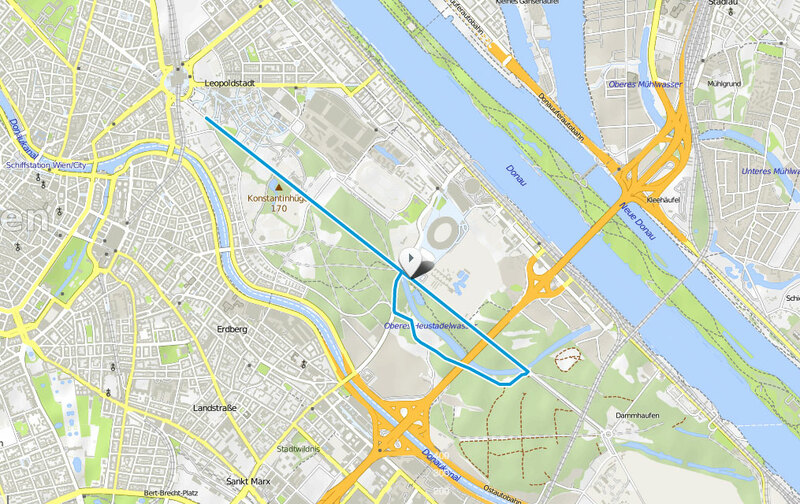 Marathon, half marathon and relay marathon start on Sunday at Wagramer Straße close to the "Reichsbrücke". 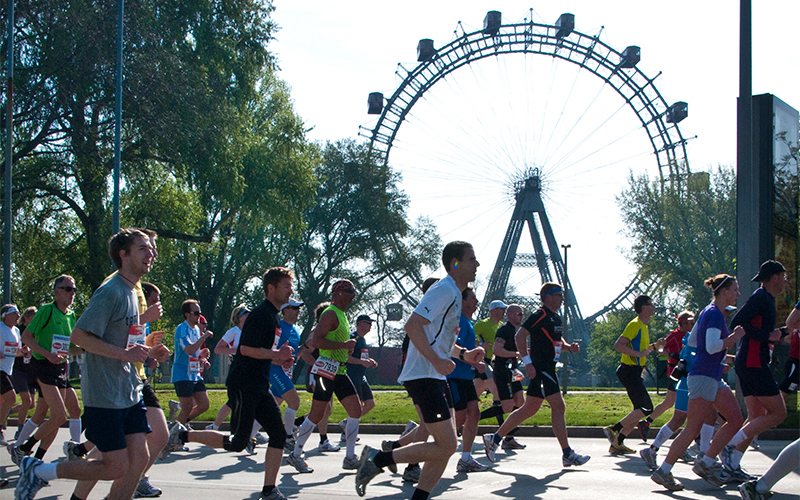 Vienna 10K and VCM Youth Race start on Saturday at Prater Hauptallee close to the ferris wheel. 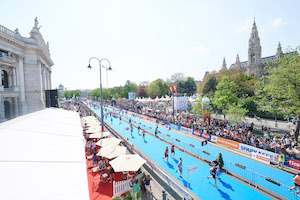 VCM Kids Race gets underway at Parkring near Stadtpark. 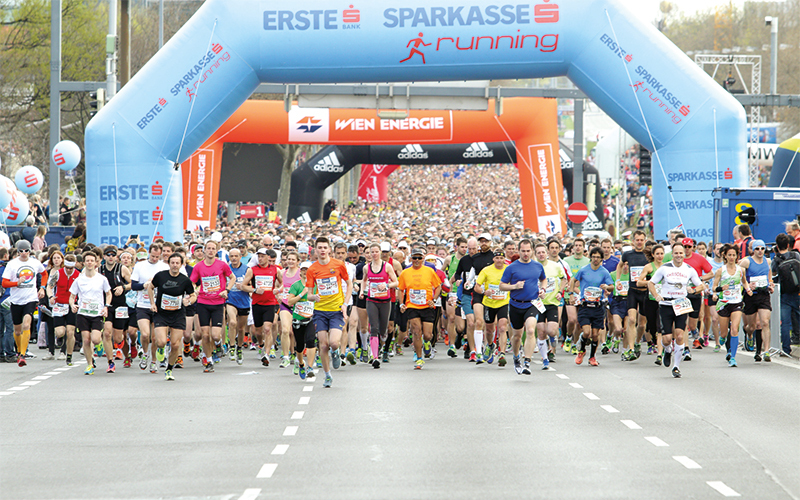 Coca-Cola Inclusion Run starts at Burgring. 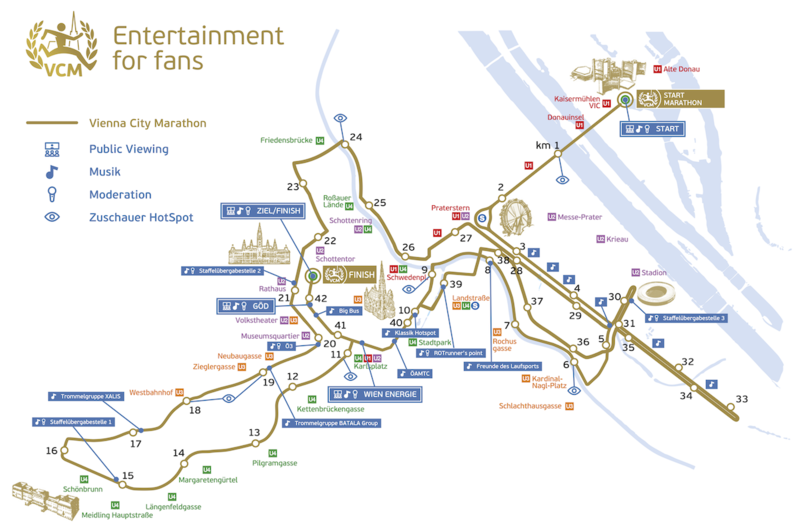 Marathon, half marathon and relay marathon start on Sunday at Wagramer Straße next to "Reichsbrücke" and UN-buildings. 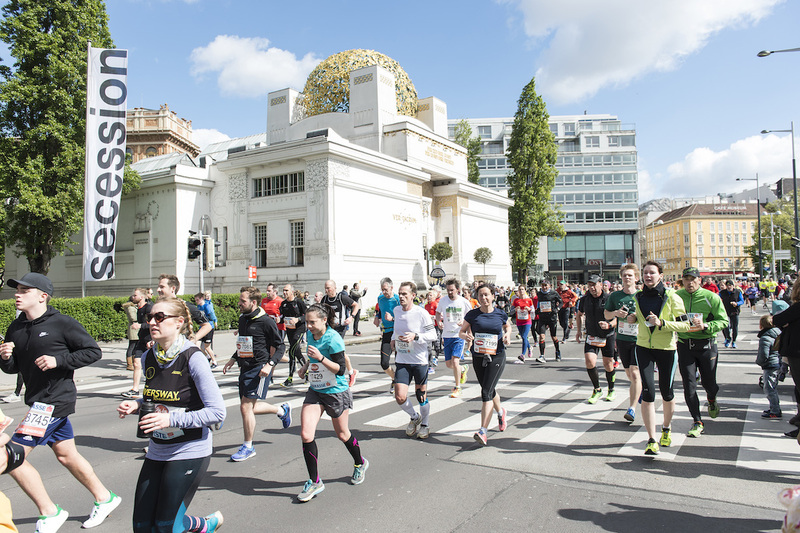 Vienna 10K and VCM Youth Race start on Saturday at Prater Hauptallee close to "Restaurant Meierei im Prater". 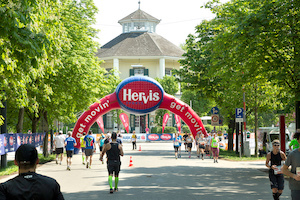 VCM Kids Race gets underway at Parkring near Stadtpark. 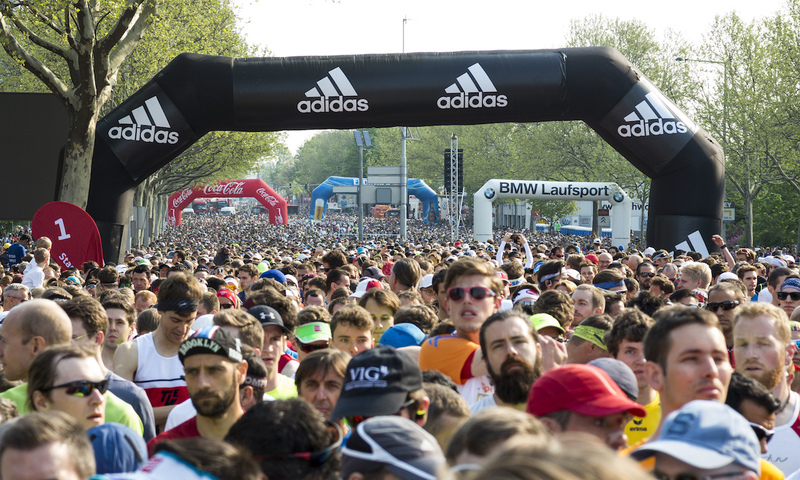 Coca-Cola Inclusion Run starts at Burgring. 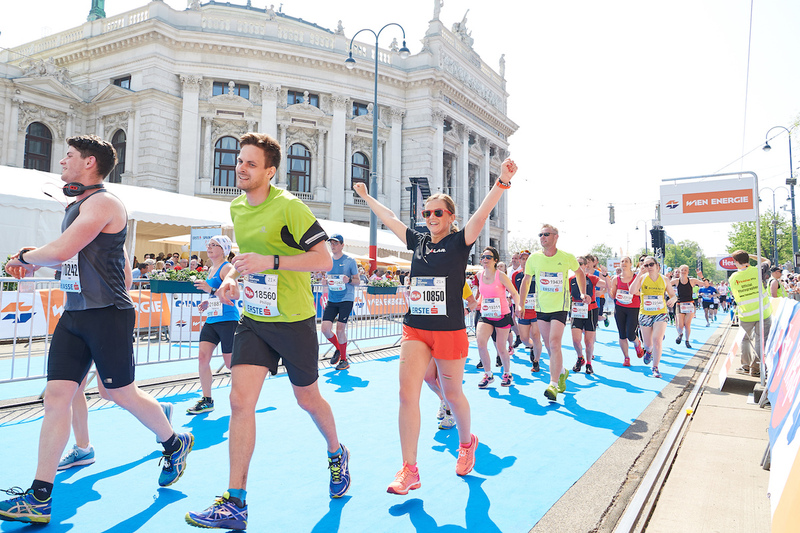 The finish area of the Vienna City Marathon is located in the city centre on Ringstraße between Vienna Burgtheater and Rathausplatz, one of the most beautiful locations in Vienna. 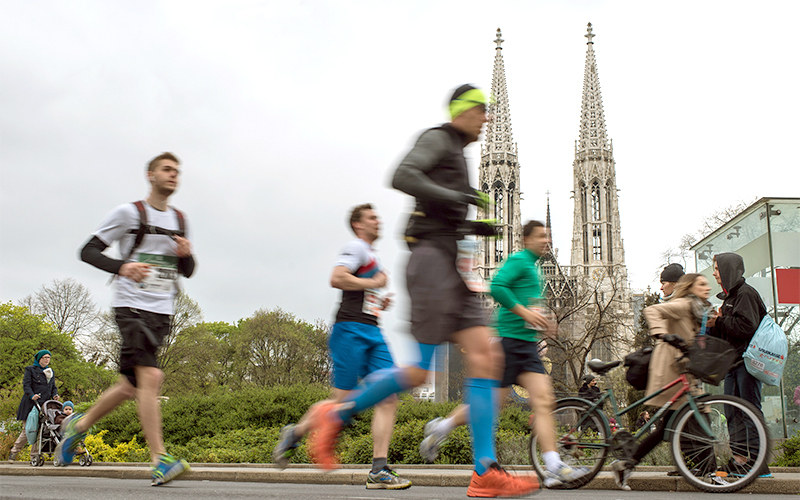 Look here for downloadable maps to find your way on VCM weekend! 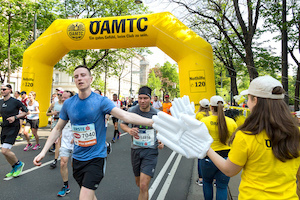 In this section you will find all relevant information about the position of the hand-over areas for the RELAY MARATHON. Hier finden Sie eine komplette Übersicht aller Verpflegstellen, Wasserstellen und Erfrischungspunkte, die am Start, entlang der Strecke und im Ziel zur Verfügung stehen werden. Bitte beachten Sie jedoch, dass sich die hier angegeben Positionen aufgrund verkehrstechnisch notwendiger Gegebenheiten geringfügig ändern können! In this section you will find all relevant information about the refreshment points along the VCM course. Please note that this information can be subject to slight changes due to traffic conditions on race day. 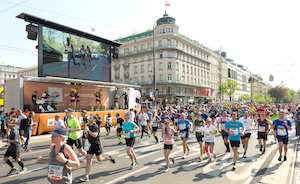 Marathon 42k: 6 hours (gross time), starting time 9 a.m. Uhr, cut-off time 3 p.m.
Halfmarathon 21k: 3 hours (gross time), starting time 9 a.m. Uhr, cut-off time 12 a.m.
Vienna 10k: 1 hour 15 minutes (gross time), starting time: 5:30 p.m., cut-off time 6:45 pm. Within this time, which is determined by the city authoroties of Vienna, the course is officially "blocked" for the participants of Vienna City Marathon. The end of the time limit will be determined by a special car which is moving with a constant speed from the start to the finish area. Runners who will be overtaken by this car have to act according to public traffic regulations and have to run on side walks if necessary. In addition the passage of this car additionaly shows all volunteers the end of the event. From that point on all necessary works such as the deconstruction of food supply station etc. have to be started. Only a few minutes after the car has passed a certain location along the course, the roads will be opened for public traffic again. Please note, that from that time on, the food supply stations will not be available anymore. 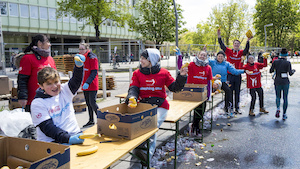 We therefore have to empazise, that all runners who will schedule their finish time around (or after) the relevant time limits, will not have any possibility to take food or drinks from a supply station. We kindly ask for your understanding and suggest to wear e.g. drink belts in means of your own security. Wagramer Str. – Reichsbrücke – Lassallestr. – Praterstern - Hauptallee – Stadionallee – Schüttelstr. 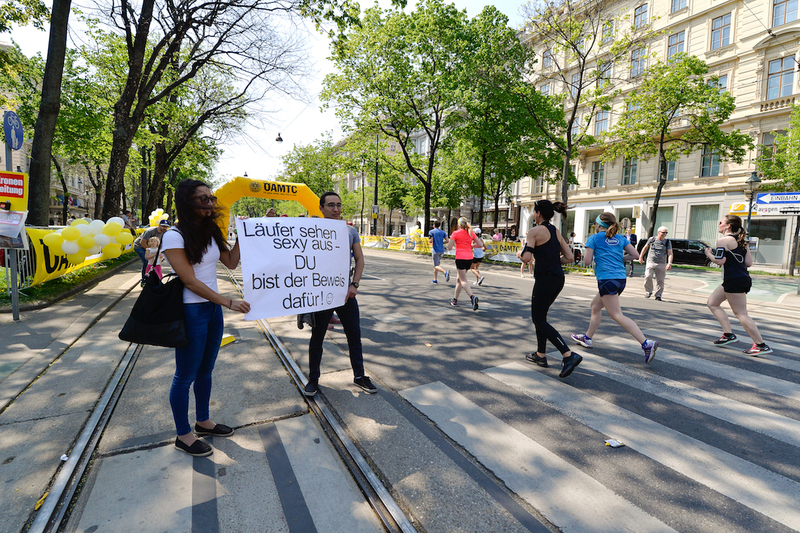 – Untere Donaustr. – Aspernbrücke - Stubenring – Parkring – Schubertring – Kärntner Ring – Opernring – Operngasse – Friedrichstr.– Linke Wienzeile – Schloßallee – Mariahilfer Str. 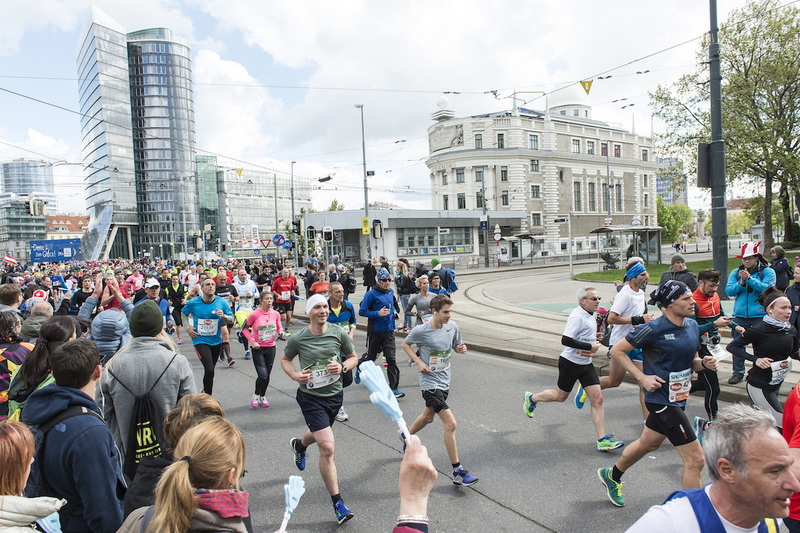 – (Finishline HALFMARATHON via Babenberger Str. 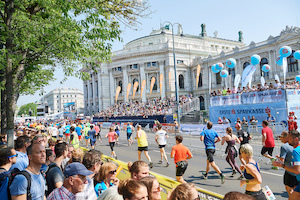 – Burgring – Dr. Karl Renner Ring - Universitätsring, finish line in front of Burgtheater) – MARATHON und RELAY MARATHON turn left on Museumsplatz - Museumstr. – Auerspergstr. – Landesgerichtsstr. – Universitätsstr. – Maria-Theresien-Str. – Liechtensteinstr. – Alserbachstr. – Friedensbrücke – Brigittenauer Lände – Obere Donaustr. – Aspernbrücke – Aspernbrückeng. – Praterstr. – Praterstern – Hauptallee – Meiereistr. 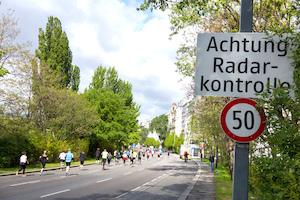 – turnaround – Hauptallee – around the "Lusthaus" – Hauptallee – Stadionallee – Lusthausstraße – Rustenschacherallee – Sportklubstraße – Vivariumstraße – Franzensbrückenstraße – Franzensbrücke – Radetzkyplatz – Radetzkystr. – Vordere Zollamtsstr. – Weiskirchner Str. 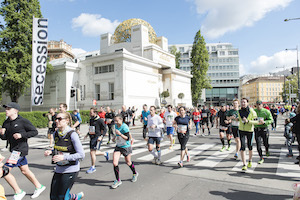 - Stubenring – Parkring – Schubertring – Kärntner Ring – Opernring – Burgring – Dr. Karl Renner Ring – Universitätsring to the finish line in front of Burgtheater = finish Vienna City Marathon and Relay Marathon, cut-off time 3:30 p.m. 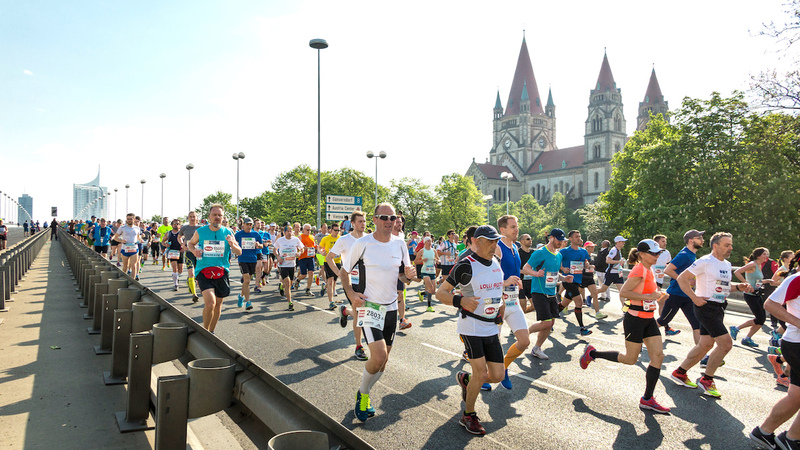 The course has been measured according to the rules of [ AIMS ], the world association of international marathons and road races. The maximum altitude is 44,2 metres, the maximum gradient 0,4 %. 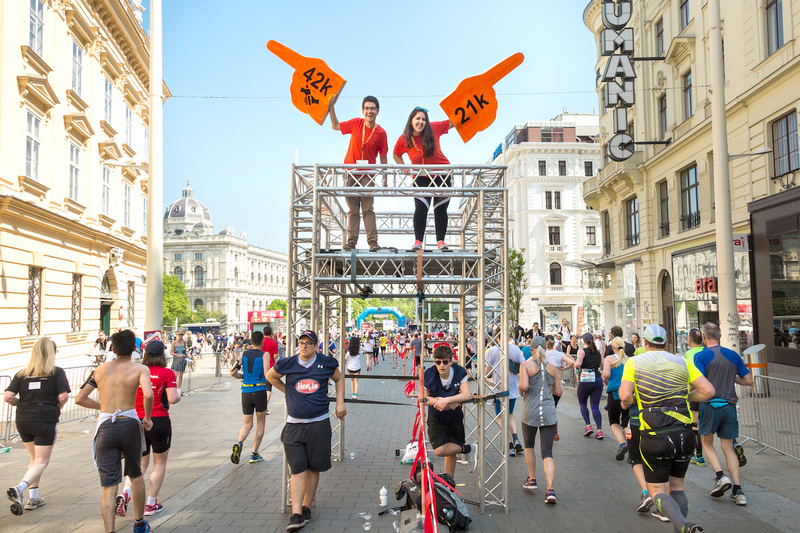 The highest point of the course is at 45,7 metres above Vienna Zero (River Danube level) and is located at km 18,6 (Mariahilferstrasse / Kohlenhofgasse). The lowest point is at km 33 on Prater Hauptallee shortly before the Lusthaus at 1,3 m above Vienna Zero. The course is a 7km-long loop, completely flat and AIMS-certified. 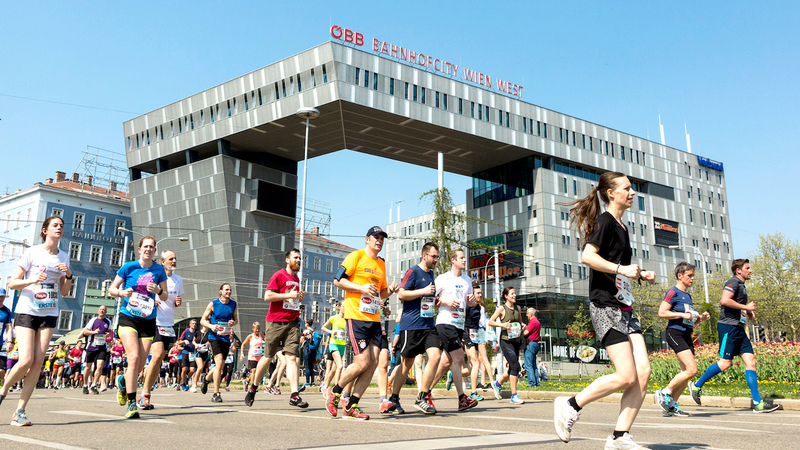 If you run 7 km (= 1 lap), you will be included in the results of the 7 km race. 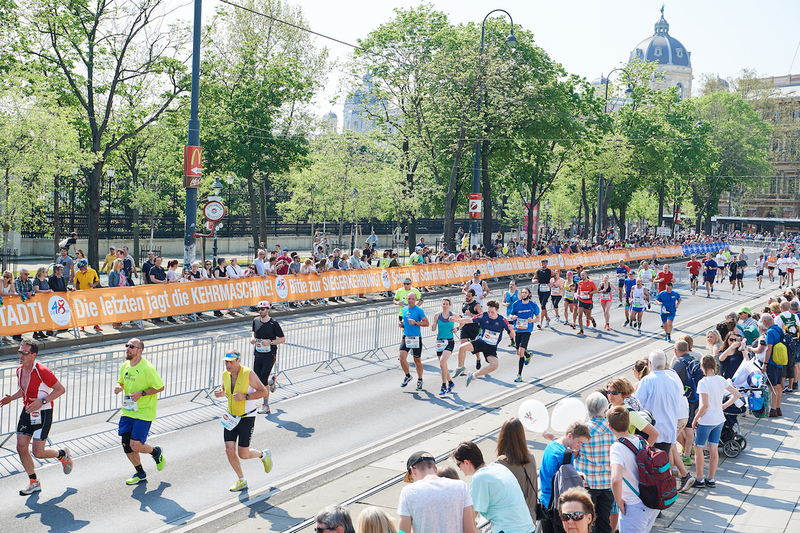 If you run 14 km (= 2 laps), you will be included in the results of the 14 km race. The same applies for half marathon and 28 km. 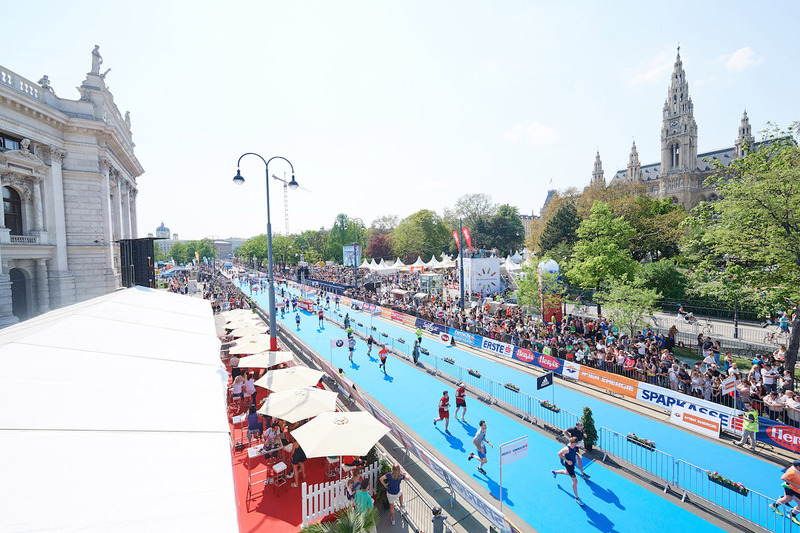 A 28 km race will be held at the third event only. Opening hours: Friday, April 5th, 2019 from 10 a.m. to 7 p.m., Saturday, April 6th, 2019 from 10 a.m. to 6 p.m. Starting documents cannot be collected on April 7th, 2019, the day of the event! 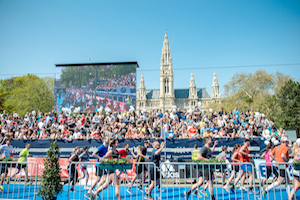 Further information about the Vienna Sports World you can find here. 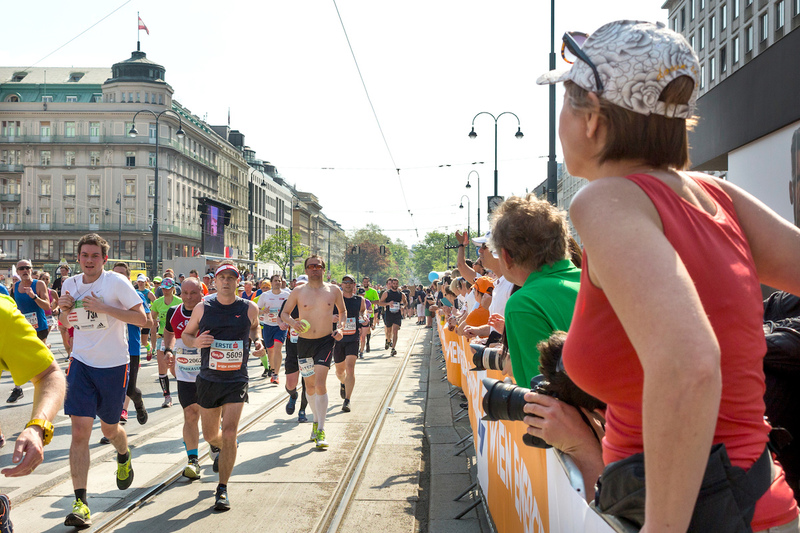 Feel the anticipation in the run-up to the Vienna City Marathon at this historic surroundings. 150 brands and exhibitors show new products and trends in sports, health, travel and events. The Marx Halle is an historic building established in 1881 and has developed into a stylish location for arts, concerts, galas and fairs. Visitors will be taken away by the industrial charme, the huge dimensions and the spectacular architectural construction of the venue. The Marx Halle is easily accessible from the city center, the main train station and from Vienna airport. Plan your trip by public transport at www.wienerlinien.at or use the WienMobil App for smart phones. Marx Halle is perfectly connected to city highway „Südosttangente“ A23, exit St. Marx. 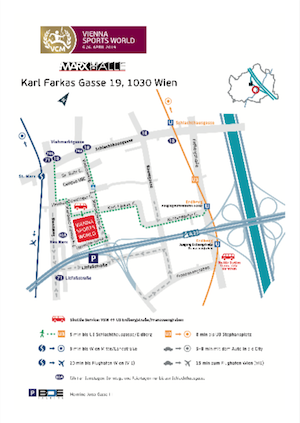 Parking garage Neu Marx (Hermine-Jursa-Gasse 11, 1030 Wien) is in close proximity. 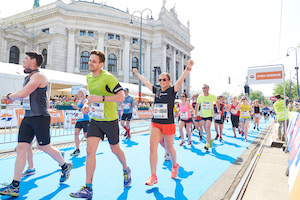 Vienna 10K Entry fee: Euro 39,– open until 3 p.m., Start 5.30 p.m.
VCM Kids Race 2K Entry fee: Euro 7,– open until 3 p.m., Start 5.30 p.m.
VCM Youth Race 5K Entry fee: Euro 10,– open until 3 p.m., Start 5 p.m. If you have registered correctly and provided your email address when you registered, you will receive your personal COLLECTION CONFIRMATION with your assigned race number in April (please check your spam/junk folder). 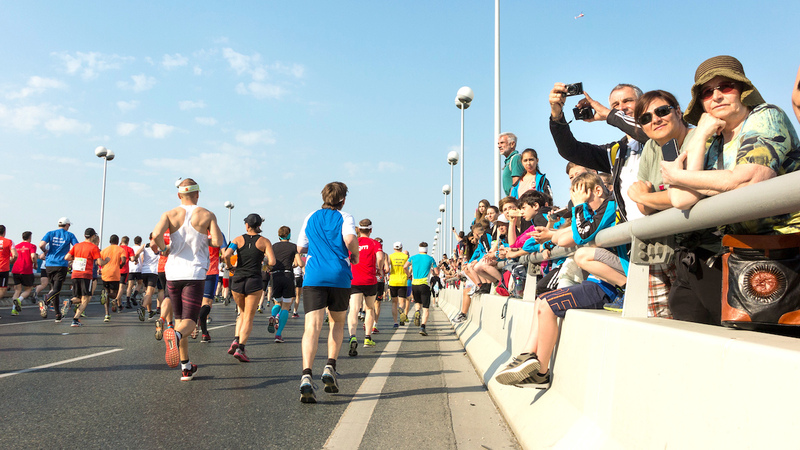 You must present your collection confirmation printed or on your mobile-device and a photo ID (ID card, passport or driving licence) to receive your race pack! 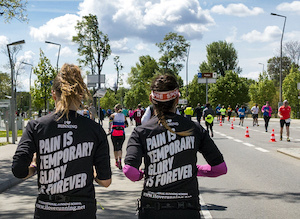 Runners who have booked extras will get tear-off strips on their race number as well, which can be redeemed at the T-shirt booth and VCM Pasta Party booth. 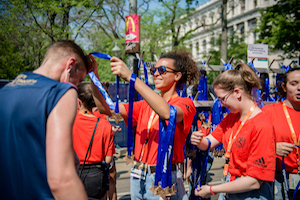 If you are unable to collect your race pack yourself, you can arrange for someone else to pick it up. You and the person who want to collect your race number must both sign the form. The form only authorizes another person to pick up your race number on your behalf and DOES NOT transfer your place in the race. 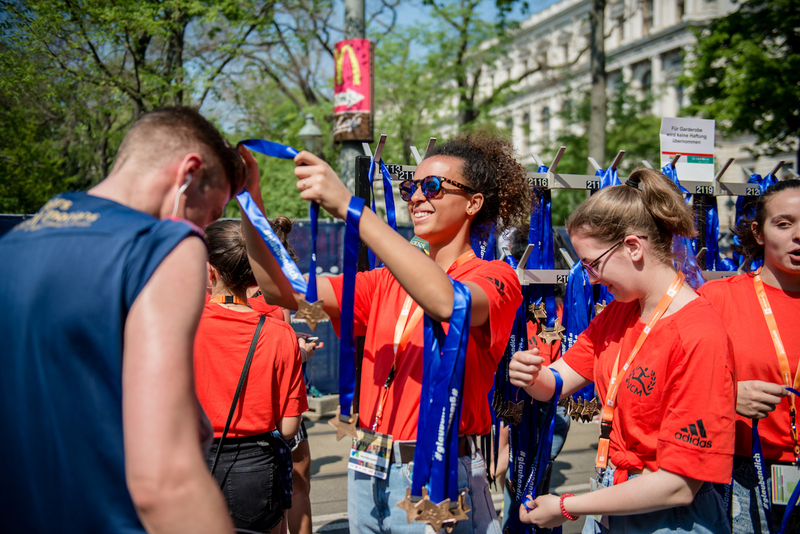 If anyone other than the contact person for a relay team wants to collect the race numbers for the relay team, they must complete the above authorization form with the contact person who registered the team. If you are unable to start the race for any reason, please do not give your race number to anyone else. Safety and security is more important than ever and your race number is used for those who are entrusted with your safety. Giving your personal race number to anyone else may put them in a difficult situation or even in danger in the case of an emergency. Giving your race number to anyone else is also entirely against the spirit of the race, as the race results will then be false. If we find that this rule has not been followed, VCM organizers may issue a ban for future events to both runners in question. Race times are recorded using ChampionChip. If you have not specified your personal chip number, a rental chip was assigned and charged to you while registration. You will receive this ChampionChip together with your start number at package pick up. 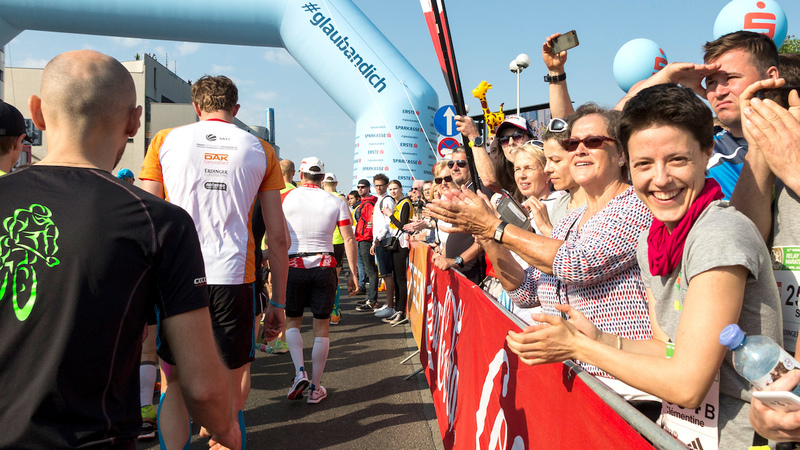 We would ask you to please return the ChampionChip in the finish area after the race (also at the relay hand over point). Within the online registration you have given your consent that in case of a non-return the chip is considered as purchased and the difference to the purchase price (Euro 29,-) can be debited from your specified account. The fee of Euro 6,- paid upon registration for the ChampionChip cannot be refunded. A chip is required in order to record your race time. Please attach the chip to your shoelace. The chip cannot be transferred. Relay marathon: All four race participants need to wear a ChampionChip to record your race time. If a participant takes part in 2 competitions, e.g. half marathon and relay, 2 ChampionChips have to be attached to the shoelaces. a local service for you! 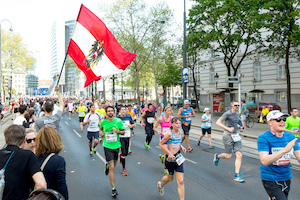 The Vienna City Marathon is a huge and international event. 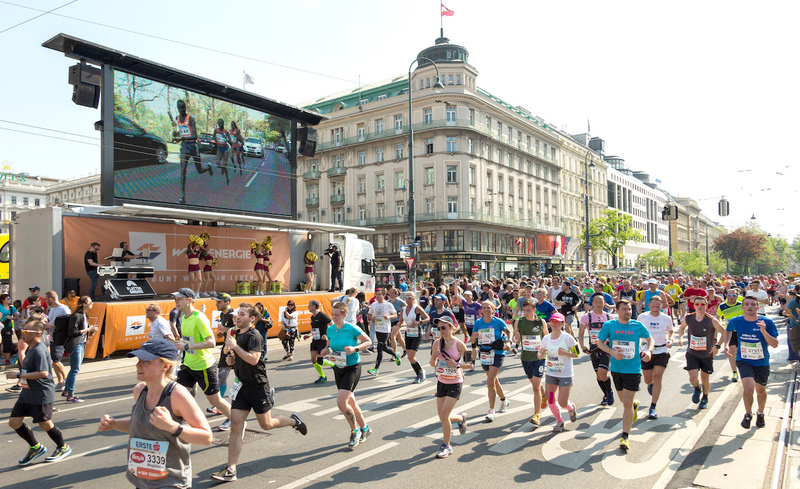 Runners from about 130 countries come to Vienna and experience the city in one of the running events. 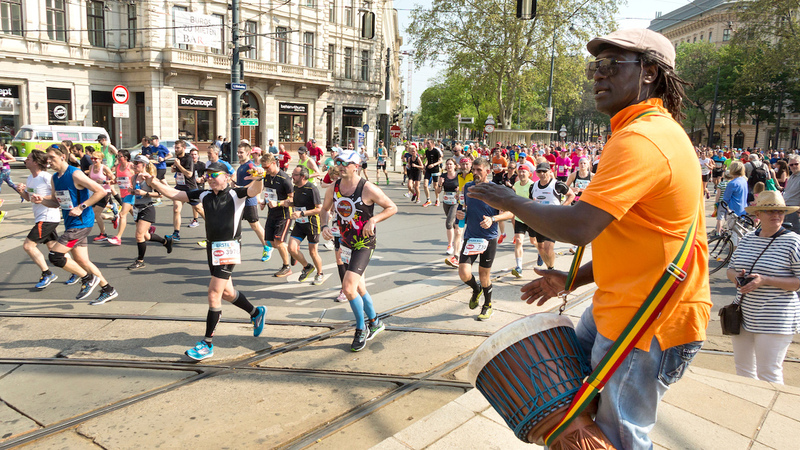 For participants from all over the world, the VCM offers a service that is unique in the marathon scene: the VCM Ambassadors. 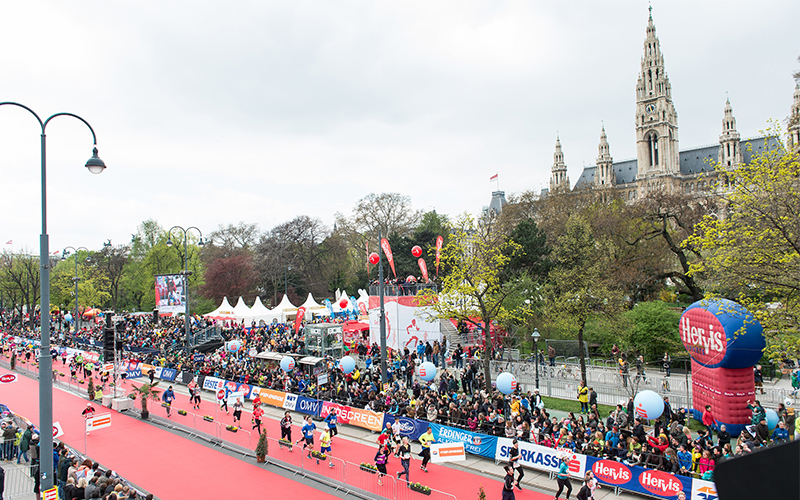 VCM Ambassadors are runners from various nations who know Vienna and the Vienna City Marathon. They help participants with tips and hints in their mother tongue and are available to answer questions about the VCM. 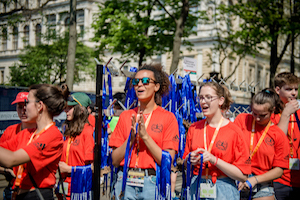 The VCM Ambassadors can be contacted here and they look forward to your inquiries. Me gusta ser embajador del VCM porque en esta competición participa gente de todo el mundo! Wenen werd niet voor niets reeds negen jaar op rij verkozen tot beste stad ter wereld om te leven! за мен е огромно удоволствие да Ви поздравя на страницата на Виена Сити Маратон (VCM). 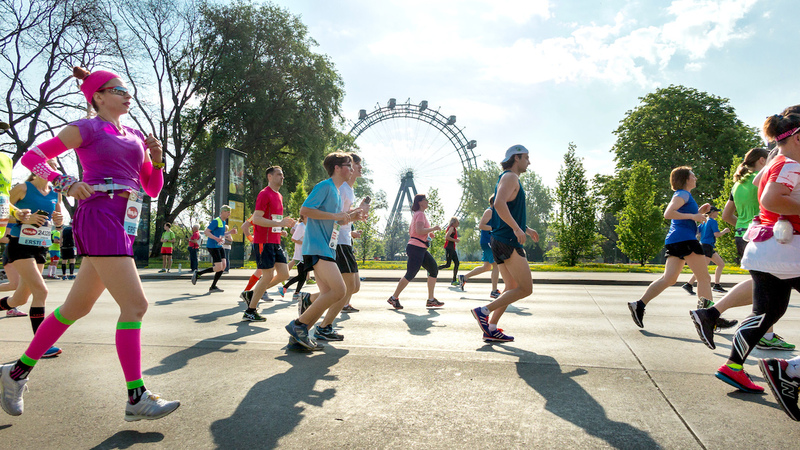 Come run the VCM and meet your fellow Canadians living in Vienna, and let us show you why we love to call this beautiful city our home. Ich freue mich darauf Fragen von Teilnehmern beatworten zu dürfen. 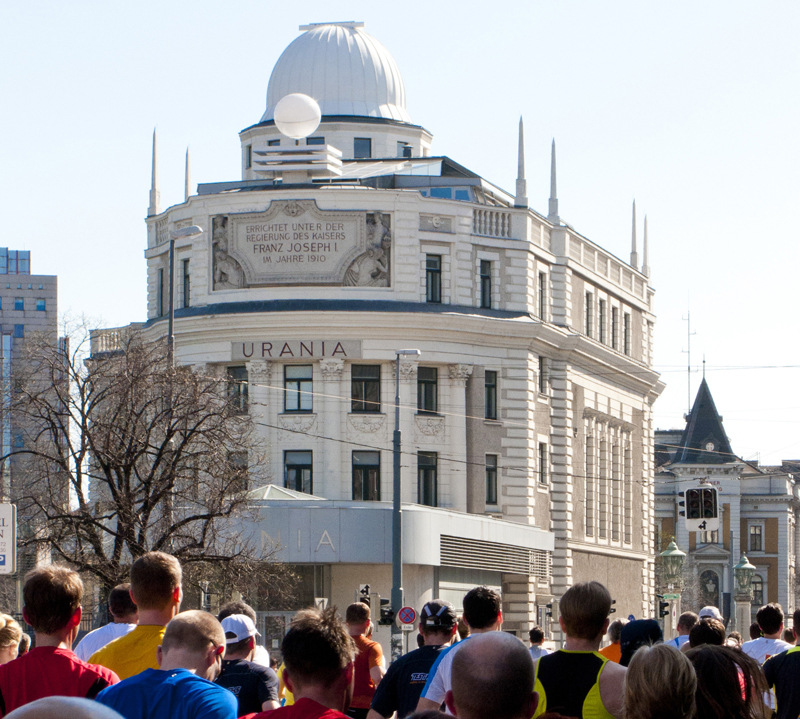 Za mene je Bečki maraton nešto posebno, jer sam odrasla navijajući za svog oca i promatrajući ga kod njegovih utrka. 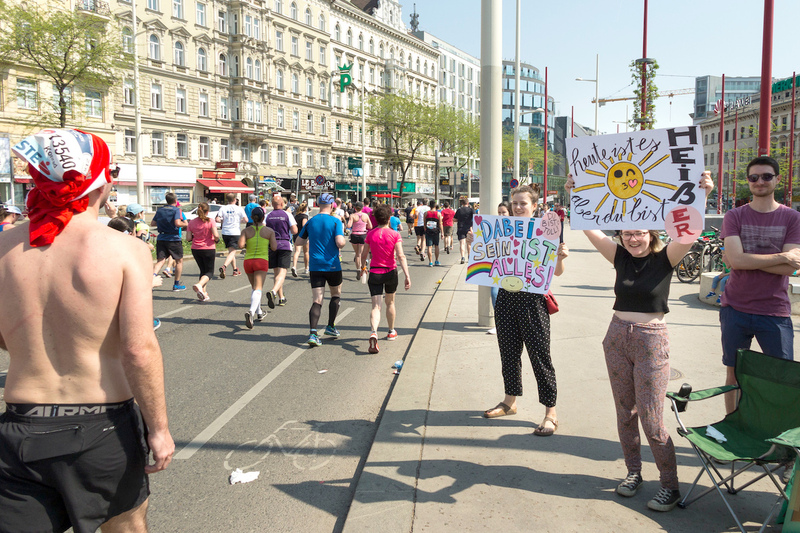 VCM se odehrává v nejkrásnějším městě Evropy, je to prakticky běžecký City Sightseeing s jedinečnou atmosférou. La alegría y el buen humor que todos tienen, da igual, atletas, espectadores, TODOS. Se on hieno, kilpailukulttuuri on reipas ja reilu, ja matkalla olevat nächtävyydet ovat hulppeita. 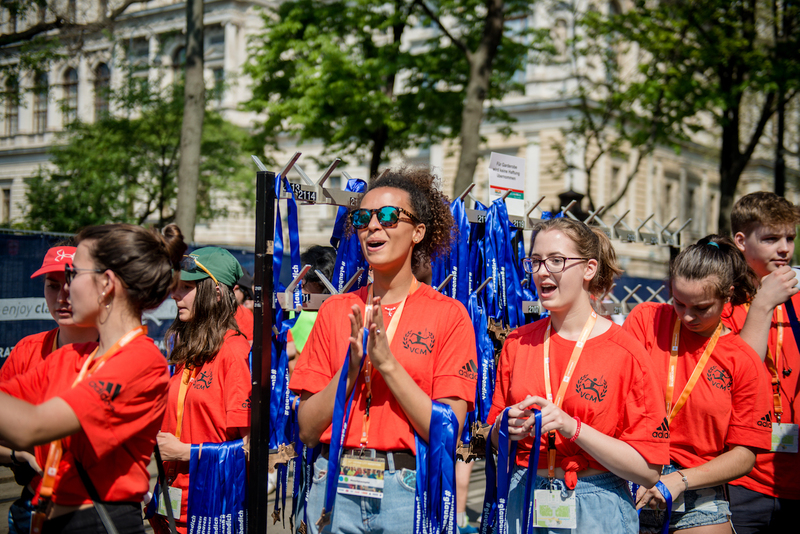 Being an ambassador is about friendship and people from all over the world coming together to face the same challenge. Ich bin VCM Ambassador, weil es mir große Freude bereitet und überaus bereichernd ist mit gleichgesinnten aus aller Welt in Kontakt zu stehen. Ο Μαραθώνιος της Βιέννης είναι η καλύτερη ευκαιρία να γνωρίσει κανείς την Βιέννη. Persze a hangulat, egészen fantasztikus! 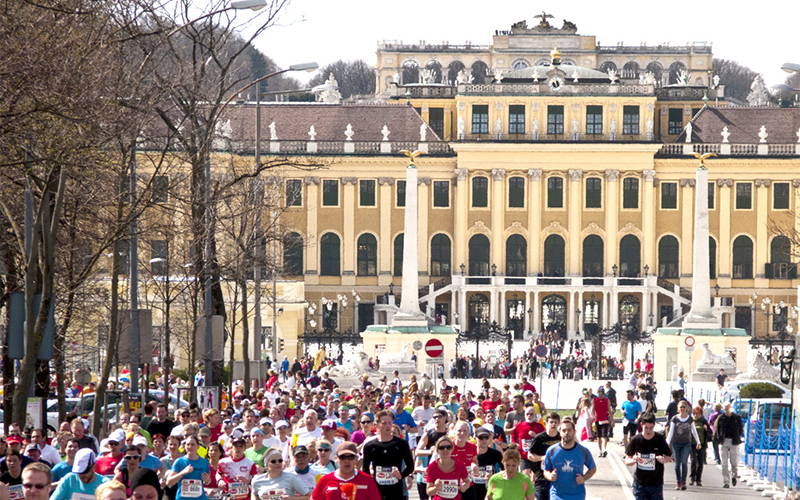 So, no doubt, VCM is the most beautiful marathon in the world because of beautiful city and beautiful people. Mi fa molto piacere poter comunicare con gli atleti e dare risposte alle loro domande. Op dem Daach fiert keen Auto duerch d´Stad, keng Alldagshektik, d`Stad gehéiert den Leefer ganz eleng, sou wei een als Leefer am léifsten mecht - am Laafschrett. Siendo media Mexicana por parte de mi madre me es un gran honor representar a Mexico en el VCM. Wenen is niet voor niks gekozen tot de stad met de hoogste levenskwaliteit en dat is ook hier in de Marathon goed zichtbaar! Jeg er selv løper og synes det er fint å få kontakt med norske og skandinaviske løpere og ha mulighete til å hjelpe dem med å få et fint opphold her i Wien. Ang pagtakbo ng marathon ay isang paraan sa paghamon ng ating limitasyon at nagkokonekta sa ating lahat bilang pangmatagalang mananakbo. Więc zapraszam do kontaku, jak macie jakieś pytania. Chętnie pomogę. 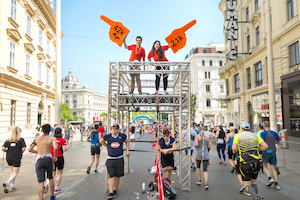 Doresc să împart bucuria de a alerga la Maratonul din Viena cu toți românii care participă. распространяю информацию о VCM и рекомендую посетить Австрию, чтобы почувствовать идеальное сочетание спорта и культурного опыта. Vsec mi je tako velika udelezba - vec kot 42.000 ljudi, ki tecejo...super energija na startu in seveda v samem cilju maratona. To je nepozabno! За страственог тркача је то изванредна прилика да упозна тркаче из свих дијелова свијета и поготову из Србије. Najlepším odporučením je, vyskúšat si to na vlastnej koži, a možem Vám zaručit, že sa zalúbite do samotného preteku, ako aj Viedne, tak ako ja sám. För mig är VCM en av de absoluta höjdpunkterna i löpkalendern här, och jag känner mig stolt och hedrad att få företräda och informera om det här loppet i egenskap av VCM-ambassadör för Sverige. 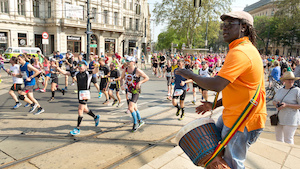 En tant que coureur amateur de marathon, expérimenté et couronné de succès, je pouvais imaginer une bonne approche partenaire pour les Togolais ou Africains francophones qui sont des candidats pour le VCM. Viyana Şehir Maratonu gönüllülerinden biri olarak hem sportif hem de kültürel alanda bildiklerimi seninle paylaşabilmekten mutluluk duyacağım. 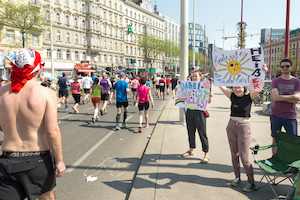 Abonniere hier die kostenlosen VCM WhatsApp News: Damit erfährst Neuigkeiten rund um den Vienna City Marathon und bekommst exklusive Infos zu Aktionen, Gewinnspielen sowie Trainings- und Veranstaltungstipps direkt auf dein Smartphone. Von Jahresbeginn bis April erhältst du in der Regel einmal wöchentlich Neuigkeiten von uns. Auch danach werden wir dich gelegentlich auf dem Laufenden halten. Folge der Anleitung im Formular, speichere die Nummer +43 677 629 88 160 auf deinem Smartphone und schicke eine WhatsApp-Nachricht mit „Start“. Es kann kurze Zeit dauern, bis du eine Bestätigungsnachricht erhältst. Du kannst dich von diesem Service mit der Nachricht „Stopp“ jederzeit wieder abmelden. Wenn du mit der VCM-Organisation in Kontakt treten willst oder eine Frage hast, schreibe bitte ein E-Mail an office@vienna-marathon.com. Nachrichten auf WhatsApp werden nicht beantwortet. Einfach hier registrieren und los geht’s! 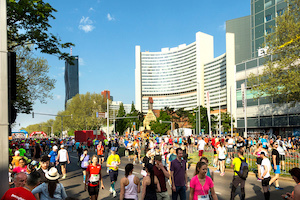 10.00 am - 07.00 pm Vienna Sports World - Expo and race documents. New location MARX HALLE, 1030 Wien. Access with subway U3, exit Schlachthausgasse or Erdberg. A free VCM bus service runs from subway station U3 Erdberg to MARX HALLE and back. Access also with S7 (Airport line), exit St. Marx. 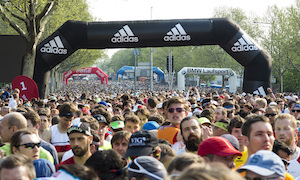 5:15 pm Shake Out Run - with Adidas runners Vienna all around MARX HALLE. 10.00 am - 06.00 pm Vienna Sports World - Expo and race documents. New location MARX HALLE, 1030 Wien. Access with subway U3, exit Schlachthausgasse or Erdberg. A free VCM bus service runs from subway station U3 Erdberg to MARX HALLE and back. Access also with S7 (Airport line), exit St. Marx. 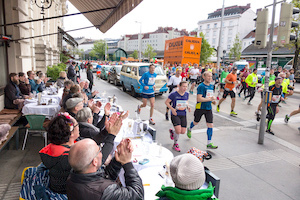 05:00 pm Start VCM Youth Race (5K) / Prater Hauptallee / Restaurant "Meierei"
05:05 pm Start Home Run (5K) / Prater Hauptallee / Restaurant "Meierei"
05:30 pm Start Vienna 10K / Prater Hauptallee / Restaurant "Meierei"
Subject to alterations. Information is believed to be correct in March 2019. 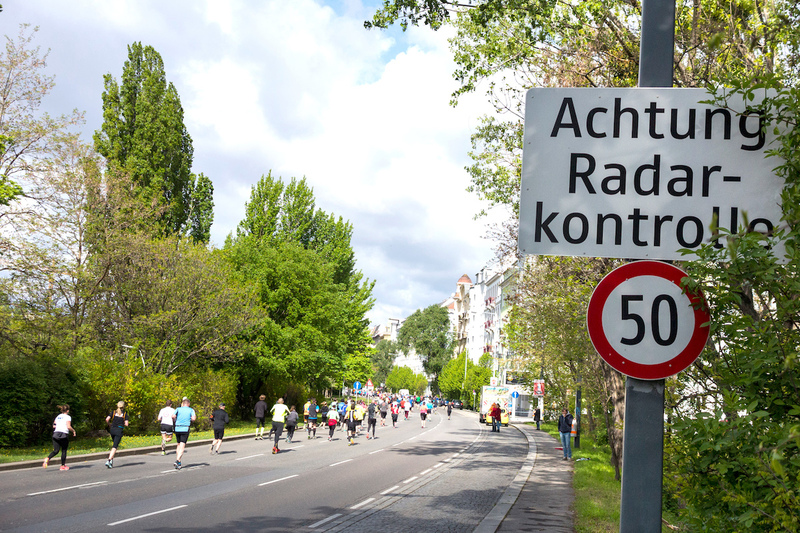 Für alle AthletInnen empfehlen wir die Anreise mit öffentlichen Verkehrsmitteln. Die Wiener Linien verkürzen auch in diesem Jahr die Intervalle der U-Bahn-Linien, um das Event optimal zu unterstützen. Anreise Startbereich: Sie erreichen den Startbereich direkt mit der U-Bahn-Linie U1 (Station Kaisermühlen-VIC). Achten Sie bitte darauf, genügend Zeit für die Anreise einzuplanen. Aus sicherheitstechnischen Gründen und wegen des großen Andrangs besteht die Möglichkeit, dass die U1-Stationen im Startbereich (Kaisermühlen, Alte Donau) temporär nicht eingehalten werden können. Um allen TeilnehmerInnen eine möglichst angenehme Anreise zu ermöglichen, ist es deswegen wichtig die Stationseingänge freizuhalten und Stationen und Bahnsteige möglichst rasch zu verlassen. Eine alternative Anreisemöglichkeit besteht über die Linie U6 (Station Floridsdorf) und den Straßenbahnlinien 25 (bis Haltestelle Kagraner Brücke) und 26 (bis Haltestelle Kagraner Platz und umsteigen zur U1). 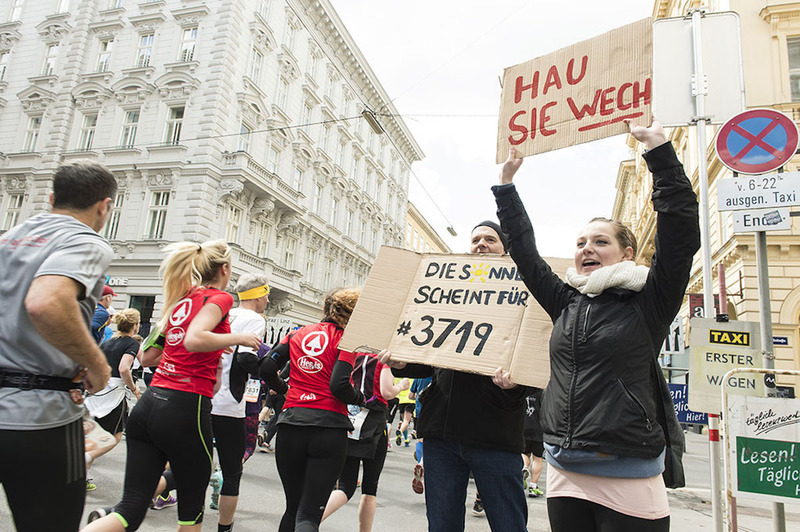 Beim "Vienna City Marathon" am 6./7. 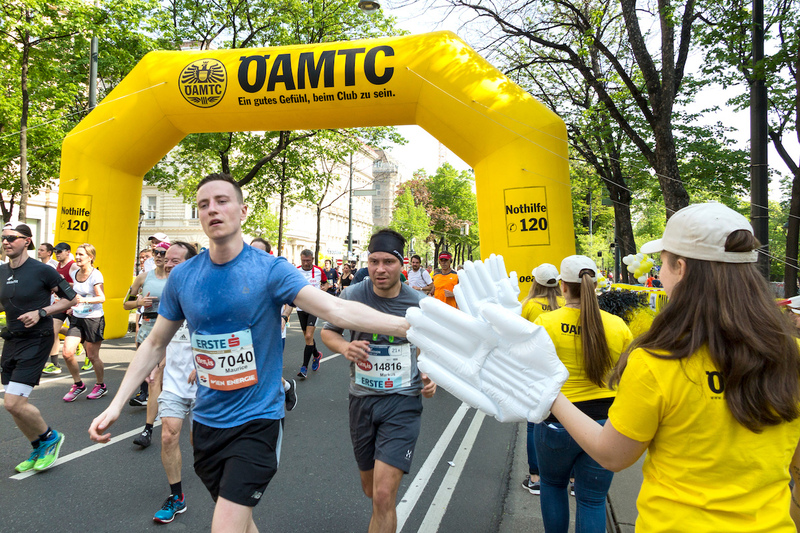 April 2019 ist der ÖAMTC offizieller Partner im Bereich Mobilitätsinformationen und bietet ein umfangreiches Angebot an Mobilitätsdienstleistungen für alle Marathon Fans. 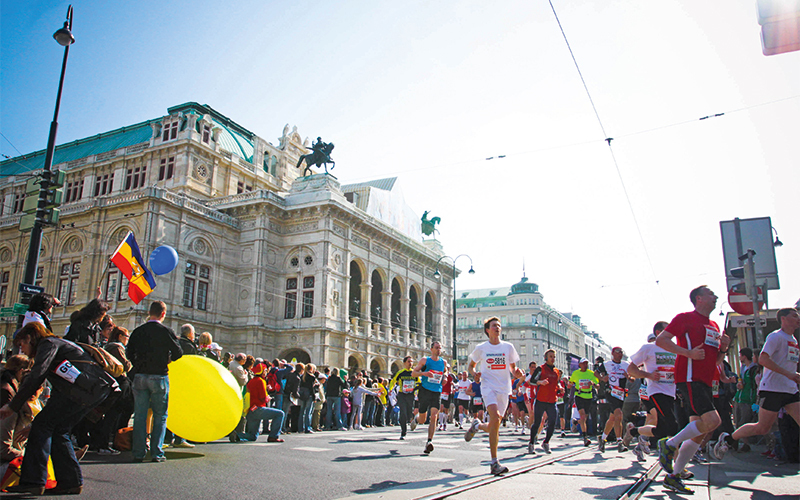 Hot-Spots for marathon fans: a guide on how to follow the VCM on the streets of Vienna. 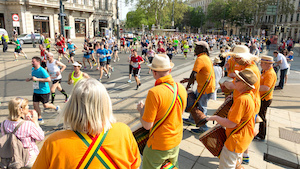 Impressive prologue of the marathon race. Nervous faces, helicopters cruising, last tips and wishes. 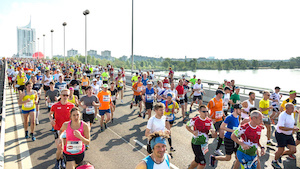 Runners cross the river Danube on the “Reichsbrücke”. 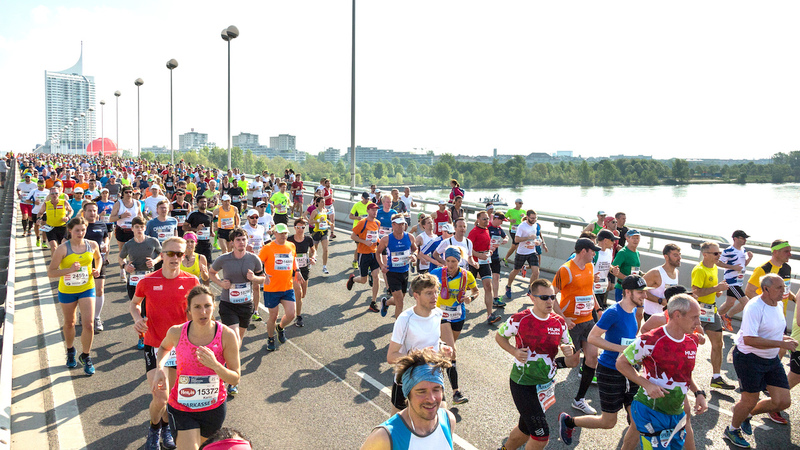 On the other side of the river, in Lassallestraße, the huge field of runners roll down the bridge like a huge wave. Austria’s most popular running location in the huge green recreation area of Prater park. Many fans cheer on both sides of the alley. Marathon runners pass this spot a second time after 27 kilometres. 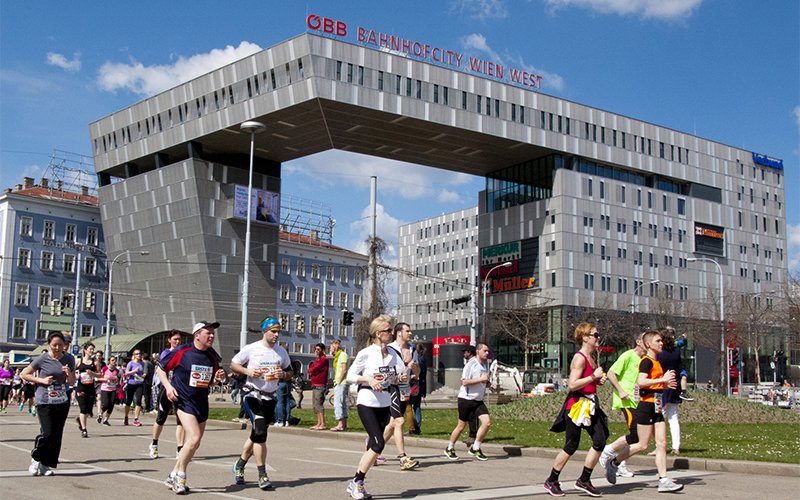 Runners reach the inner city on the „Aspernbrücke“ right beside observatory “Urania”. 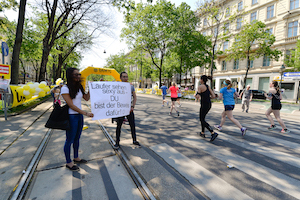 Ringstraße between Stadtpark and Opera is a true highlight on marathon day. A huge video screen is situated on front of the Opera with commentary and performances on stage. Secession and Naschmarkt are within walking distance. A great spot in front of the imperial castle, which is the most visited site in Austria. First relay hand-over. Austria’s most popular shopping street. Slightly downhill passage. Votivkirche and University form a great backdrop. Second relay hand-over. Within walking distance from the finish. Runners pass this spot four times. Third relay hand-over. 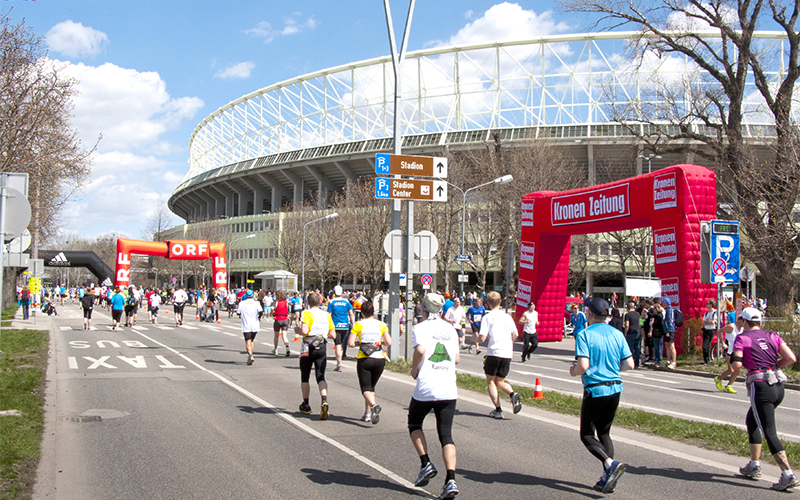 Close to Ernst-Happel-Stadion, two kilometres from the „Lusthaus“, the eastern most point of the marathon course. All events on Saturday and Sunday finish here. 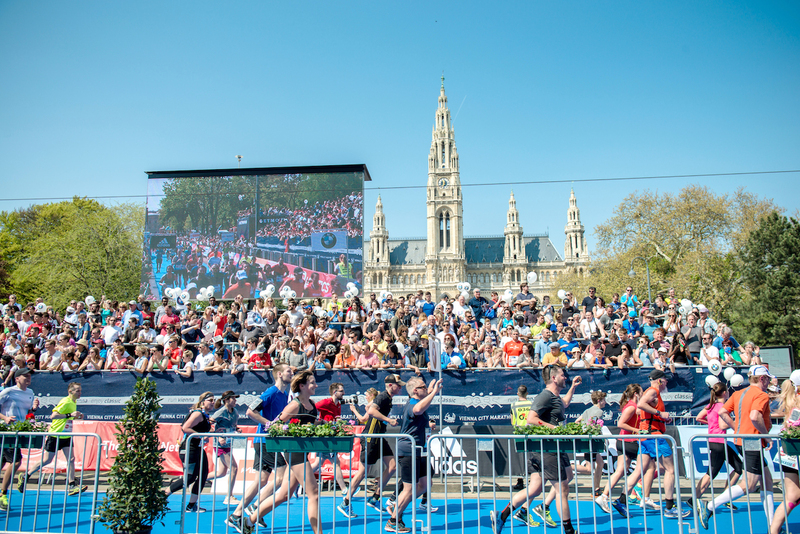 Stands with free access, video screens, music, speakers, Fan TV, victory ceremonies, food & drinks, meeting point with your runners …. 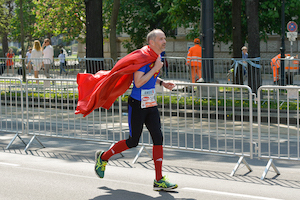 Half marathon finishes from 10 am, marathon finishes from 11 am. 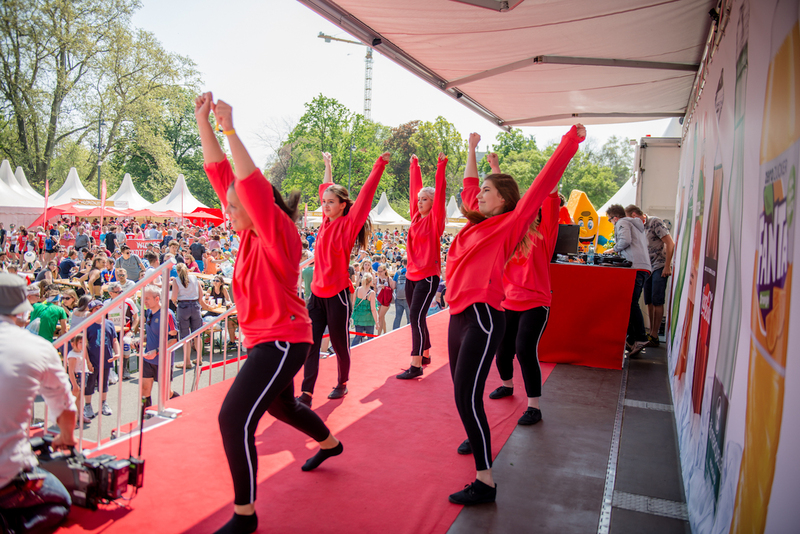 On Saturday there are to main spots: the starting area in the Prater close to the Ferris Wheel and the closing stages of the races on “Ring” between Stadtpark, Opera and the finish. 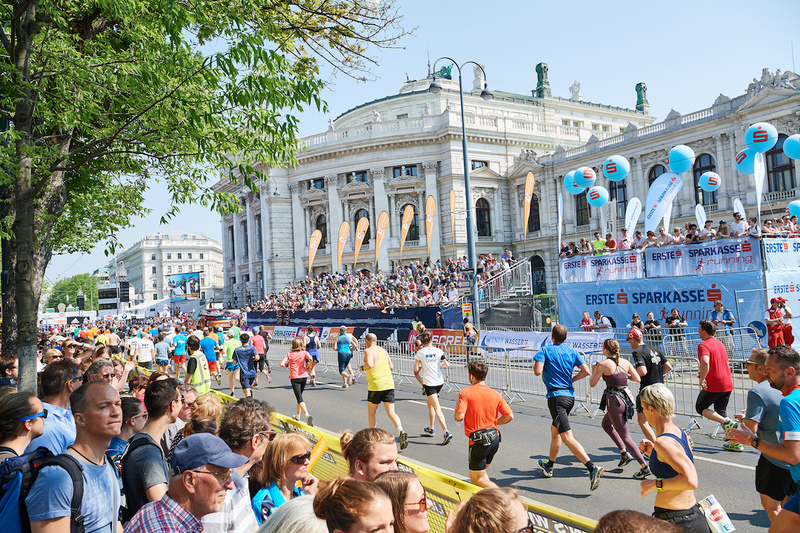 All races finish in front of the Burgtheater on Universitätsring. This is has to be the highlight of the day. There are stands with free access, video screens, music, speakers, Fan TV, food & drinks, meeting point. Runners come in from 4.30 (Coca-Cola Inclusion Run) and between 5.15 and 6.45 pm. 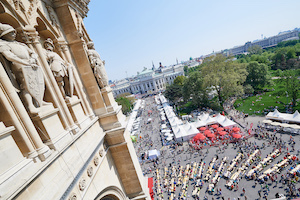 The VCM Pasta Party in the grand ball room of Vienna City Hall takes place in close proximity of the finish. Opening hours 2 – 7 pm. Free entry. Pasta, Kaisermarrn (Austrian pancake) and drinks available for sale. 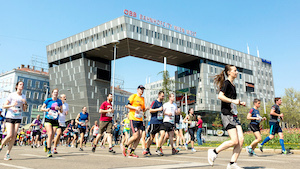 From the Expo Vienna Sports World at the new location MARX HALLE: VCM shuttle bus to subway station U3 Erdberg. Take subway U3, exit Stephansplatz (6 stops), change to subway U1, exit Praterstern (3 stops), approx. 800 m walk. VCM shuttle bus to subway station U3 Erdberg. Take subway U3, exit Stubentor (5 stops), approx. 300 m walk. Three stops without changing using U2 line. From Praterstern station (direction “Karlsplatz”) to „Schottentor Universität“ station. Scheduled travel time 4 minutes. Then approx. 300 m walk. VCM shuttle bus to subway station U3 Erdberg. Take subway U3, exit Volkstheater (8 stops), approx. 600 m walk. Musikprogramm "Run Vienna Enjoy Classics"
Orientieren Sie sich an den Durchlaufzeiten der AthletInnen und seien Sie hautnah dabei! The official Vienna City Marathon 2019 App is out and available to all runners, fans and supporters. 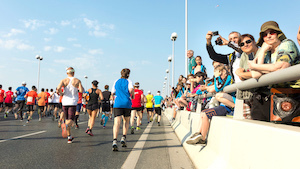 It provides news and support prior to, during and after the event including event information, live news feeds, live results and runner tracking. It is free and available for Android and iOS devices. 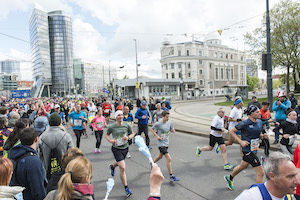 Just search for “Vienna City Marathon 2019” or “VCM 2019”! 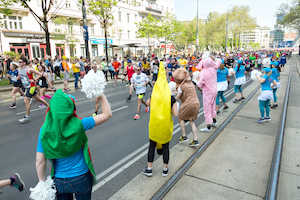 A unique feature of the VCM 2019 App is a crowd density map during marathon. It allows a live overview on how many people are where in the event area. People may choose to avoid crowded places or target certain locations. The App as a sensor for movements becomes a highly practical, yet scientifically based, tool to improve overall security. You get the latest news around the marathon directly on your phone. 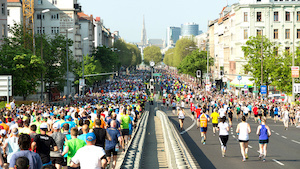 The news ticker keeps you up to date during the marathon itself and in the days leading up to the marathon. View the courses of various competitions of the Vienna City Marathon and find the locations of several points of interest and practical information such as toilets on an interactive map. The Runner Tracking feature allows you to create a list of runners and virtually follow their progress through location updates and on the course map. Browse through the results of the current and the past marathons. The VCM 2019 App was developed by the Institute for Pervasive Computing at the University of Linz (Prof. Alois Ferscha, Michael Matscheko, Dominik Hochreiter) and is available for Android phones and tablets (requires Android 4.0 and up) at Google play and for iOS devices (iPhone, iPod touch, iPad) at the App Store (iOS 9.2 or later). dritten Stunde gilt bereits der Tageshöchsttarif.